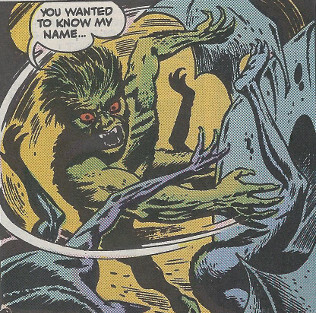 Powers/Abilities: Kruzak apparently existed in man-bat form; it is unrevealed whether he could or did transform into more fully human or bat forms. His wings came off of his arms, and he can fly while carrying a somewhat overweight adult human male, grasped by his taloned feet. Like most vampires, Kruzak has superhuman strength (typically enhanced human) and requires regular blood meals to survive; further, feeding on a human victim would presumably turn that victim into a vampire, depending on the extent of the feeding and other circumstances. He could also presumably be slain via injuries suffered at the hands of another magical creature, such as a werewolf. Weight: Unrevealed; approximately 150 lbs. (Marvel Tales I#113/2 (fb) - BTS) - Deszo Kruzak was part of a bat-like coven of vampires living in a cavern in some Hungarian mountain. (Marvel Tales I#113/2 (fb) - BTS) - Kruzak's vampire coven came to respect and fear the savage and powerful werewolf known as the Beast-Man, who allegedly boasted of capturing better victims than the vampires; the Beast-Man was known for enjoying his victims' pleas for mercy. (Marvel Tales I#113/2) - Deszo Kruzak spotted and targeted what he considered to be a well-fed victim walking outside a "lonely village" in Hungary (actually the Beast-Man in his unassuming human form). Kruzak swooped down and knocked over his would-be victim and prepared to quench his thirst, but then instead decided -- that since it had been a long time since any of his people had caught such a juicy victim -- to take his victim back to his vampire coven to show him off. Carrying aloft his victim, Kruzak stated, "Never again will the Beast-Man be able to boast that he captures better victims than we vampires!" As Kruzak approached, the other vampires were pleased to see a new victim, still alive, and they cheered Kruzak. 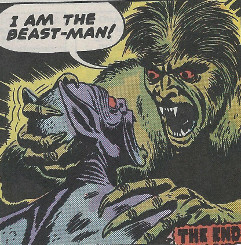 Upon landing, Kruzak asked his brethren if the Beast-Man had ever made a capture such as this; they assured Kruzak that the Beast-Man had not, and that his victim was the prize-winner. When one of the other vampires proposed they draw lots for who would have the victim first, Kruzak refused, insisting the victim was his captive and belonged to him. 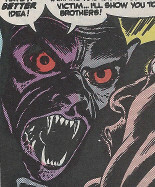 This other vampire (or another) exclaimed that Kruzak was getting as brutal and dangerous as the Beast-Man, but another vampire argued that no could be as horrible as the Beast-Man. One of the vampires requested that he wanted to hear the victim speak before he died. Kruzak agreed, noting they would enjoy the victim's cries as he pleaded for mercy, and another vampire added, "just as the Beast-Man used to do." The vampires crowded around; one asked the victim where he lived and what was his name; a second noted that the victim could not speak, as his tongue was frozen with fear; and Kruzak said, "No...look...his mouth is opening...he's moving..."
Effecting his transformation and revealing his true nature, the Beast-Man suddenly tore through the vampires and attacked Kruzak, replying, "You wanted to know my name...I AM THE BEAST-MAN!" It is unrevealed whether Kruzak and his brethren were all originally humans bitten and vampirized by other vampires, or whether they were a race of vampires that reproduced by some other means...in addition to vampirizing others and adding to their number. Thanks to Hungarian veterinary neurosurgeon Beatrix Nanai for providing a large number of Hungarian or Romanian real names for the vampires and werewolves entries for the OHotMUs! I thought I remembered a better adjective for "bat-like" (or, of or pertaining to bats). My search brings up noctillionine and pteropine (the latter specifically referring to the "flying fox" family of bats). I'd have though something with "khir" in it...but maybe I'm JUST old and senile. Kruzak and his ilk would presumably have been restored via the prophecy spell in Blade III#12. 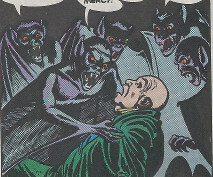 (Marvel Tales I#113/2 (fb) - BTS) - Deszo Kruzak was part of a bat-like coven of vampires living in a cavern in some Hungarian mountains. (Marvel Tales I#113/2 (fb) - BTS) - Kruzak's vampire coven came to respect and fear the savage and powerful werewolf known as the Beast-Man, who allegedly boasted of capturing better victims than the vampires, and he was known for enjoying his victims' pleas for mercy. 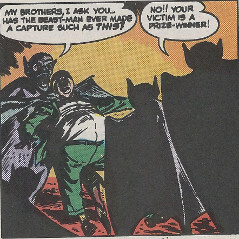 (Marvel Tales I#113/2) - Deszo Kruzak spotted and targeted what he considered to be a well-fed victim walking outside a "lonely village" in Hungary (actually the Beast-Man in his unassuming human form). Kruzak swooped down and knocked over his would-be victim and prepared to quench his thirst, but then instead decided -- that since it had been a long time since any of his people had caught such a juicy victim -- to take his victim back to his vampire coven to show him off. 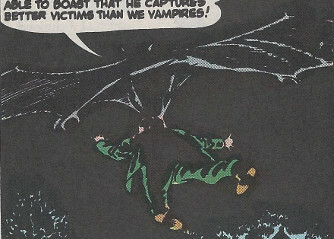 Carrying aloft his victim, Kruzak stated, "Never again will the Beast-Man be able to boast that he captures better victims than we vampires!"